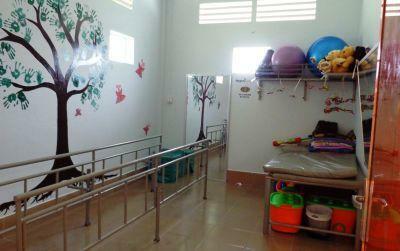 Home of Hope is a center for children and male adults living with disabilities. It lies on the outskirts of Phnom Penh and is one of our three partner organizations for our physical therapy and occupational therapy projects. We are delighted to announce that, after a summer of hard work, our volunteers have finished converting two disused rooms at the center into a physical therapy room and a sensory room. An amazing group from a school in Australia started the renovations by creating and decorating the physical therapy room. They then passed the baton on to our hard working High School Special volunteers in July who finished constructing the sensory room and providing much needed shade over the playground. We are immensely grateful to both of these groups for their help with the transformation and we are now trying to ensure that their efforts have a long term impact. We are, therefore, now seeking independent-minded, professional physical therapists and occupational therapists to help care for the 39 residents at the center. If you have spent at least three years studying physical therapy or occupational therapy at university, you’d also be very welcome. In accordance with the Projects Abroad Care Management Plan, we have made a long-term commitment to improving the quality of life for those living with disabilities. With the help of skilled volunteers, we hope to offer the specialized stimulation that is severely lacking for these patients. Skilled volunteers are also able to help train some of the local staff in basic treatments like massage and how to properly hold and support the children. 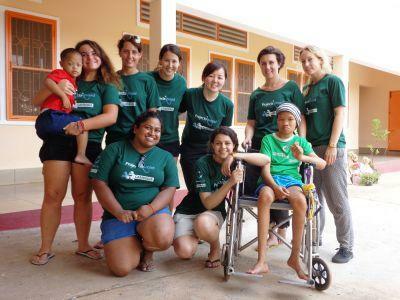 To find out more about how to volunteer on this worthwhile project, check out the Physical Therapy and Occupational Therapy in Cambodia pages.